I found this cocktail in the May / June 2014 issue of Imbibe Magazine -- it was created by bartender Ryan Casey of McCrady's in Charleston. It's basically a twist on a Negroni with a Pastis / Absinthe float. It's definitely worth a try, not just for the taste, but for the dramatic effect of the float. Ryan's recipe calls for Cynar (an artichoke based Italian bitter liqueur), which I love, but for some season don't have a bottle of at home. Instead, I used Amaro Lucano, another bitter liqueur, but perhaps with more of an orangey flavor. This being my first effort, I think I overdid the float. I used most of the 4 ounces of the Pastis / water milky combination (the louche-effect), but think 2 to 3 ounces might be better. 1) In a small jug, add water to Pastis to make a milky mixture. Put to the side. 2) In a mixing glass, add the Gin, Pastis, Sweet Vermouth and Amaro. 3) Add ice and stir the mixture. 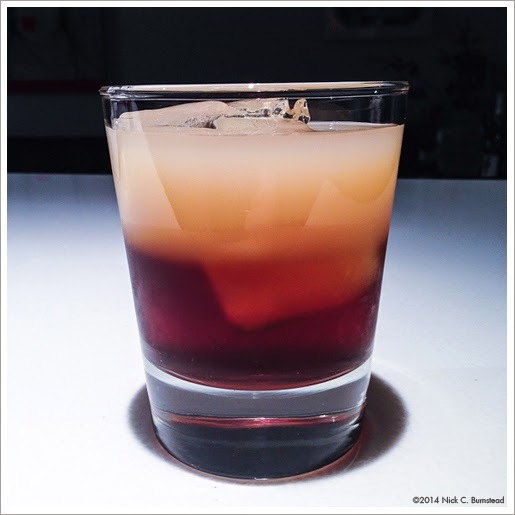 4) Strain over large ice cubes in an Old Fashioned or Rocks glass. 5) Using a bar spoon against the side of the glass, float the Pastis / water mixture to create the two layers.